The Ton September Release: Blog Hop! Welcome back to the blog hop day for The Ton’s September Release! We have some absolutely fantastic guests with us today to help celebrate this absolutely fantastic release! So many stamp sets, so many coordinating dies, not to mention word dies (who’s super freaking excited for those?! I know I am!! ), and even some new couture gilding mixes!! You should have arrived from Mayline’s blog and your next stop is Laura’s blog. I have a couple of pretty watercolored projects for you today, so let’s get started! My first project is a super festive shaker card… because, when I was looking through the arsenal of projects I created for this release, I realized that not a single one of them was a shaker card! Oh, the horror! I decided to rectify that immediately and pulled out the brand new Holiday Border stamp, Mistletoe Kisses, my Zig markers, and the new Santa’s Sneezes Couture Gilding Mix. I started by heat embossing the incredibly gorgeous new Holiday Border stamp onto some Bristol card stock and some silver pearl embossing powder. I have started using Bristol for those background stamps that have really solid images… they just heat emboss so much more nicely than on the textured watercolor paper. I used a couple of different shades of red, some pale gray, and a touch of bright green on the mistletoe to color this pretty border. I added some white Wink of Stella to the more solid poinsettias, but you can’t really tell in the photos. So pretty and shimmery in real life though! After it was all dry, I die cut a window from the center using one of the smaller Stitched Rectangle dies, then stamped the greeting from Mistletoe Kisses using Caviar Hybrid ink in the center of my white card base. I covered my window with acetate and filled up my shaker with the new Santa’s Sneezes Couture Mix. Isn’t that mix of pretty reds and silver and clear just so lovely?? My last project is one that just makes me happy. So much watercoloring, so much style, so much deep, rich color… Coloring this was so pleasant, and this is definitely a project that will be replicated for my holiday card stash. 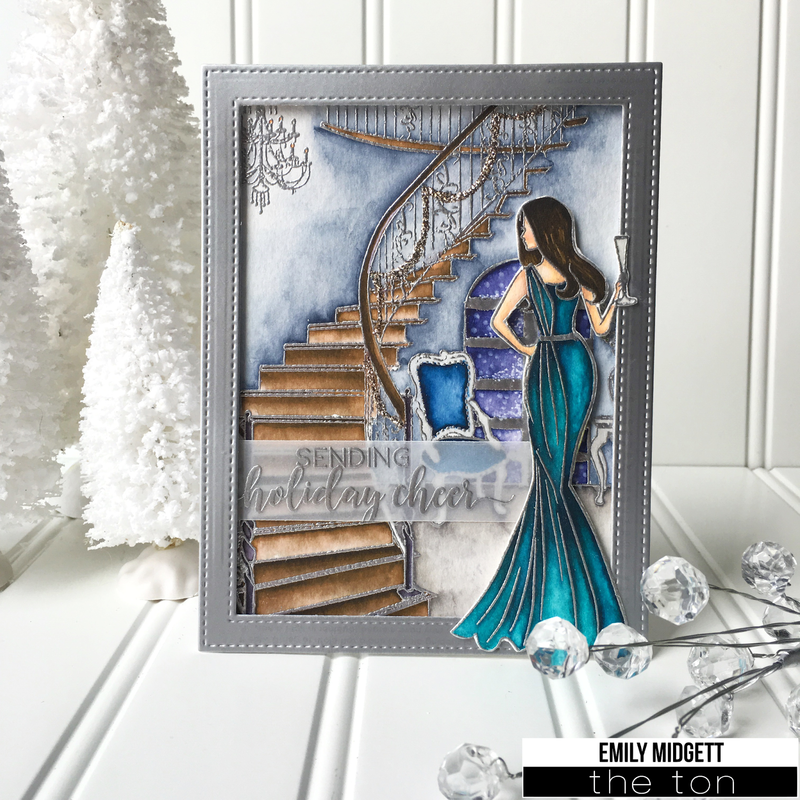 To start, I heat embossed the Scenes: Grand Stairway and the beautiful girl from Born Classy using silver embossing powder on my favorite Montval watercolor paper. I wanted to create a holiday card, so I used my T-ruler and a Versamark pen to turn the doorway beneath the stairs into a window looking out into a snowy night. After watercoloring the scene, I added some “snowflakes” using my white gel pen and a white chalk marker that I found in my stash. To add to the holiday feel, I used some Mercury Glass Stickles to add some sparkly garland going down the stairs. Normally, Stickles take too long for my impatient self to wait for them to dry, but this was one of those projects that demanded them. Once I had completed the background scene, the really really fun part began: watercoloring the knockout from Born Classy. That dress is just…. there aren’t words. So gorgeous. I made certain that she had a festive and sparkly glass of champagne to fully complete the holiday feel. Her dress was colored with a shade of dark teal and then shadows were added with a navy blue Zig marker. I absolutely am in love with her dress and want one for myself (along with her figure… bahaha). I added some Spectrum Noir shimmer pen over the top of the draped portion of her dress to make it really sparkle. I fussy cut her out, but you could use coordinating dies to save time. I die cut a frame from some Matte Silver paper using the Stitched Rectangles dies, then popped it up with dimensional adhesive. I heat embossed the sentiment (from Scripty Holiday Greetings) on a strip of vellum, tucking the adhesive on the ends where the frame and the festive chick would be conveniently hiding my Scor Tape. I popped our graceful lady up with some dimensional adhesive, letting the folds of her dress fall outside of the frame to add extra dimension. Well, that’s all for me today! I hope you’ve had an absolute blast with this release… It’s been so much fun for all of us, too! Now it’s time to hop along to see all of the incredible eye candy that the guest artists have whipped up for you! You should have arrived from Mayline’s blog and your next stop is Laura’s blog. If you’ve lost your way along the hop, start back at The Ton Blog to find the order of the blog hop. You surely don’t want to miss any of these beautiful projects! Effie will be giving out four $25 gift certificates to The Ton’s store to winners randomly selected from the commenters. Leave a comment on each blog, because the more comments you leave, the more chances you have to win! (One comment per blog, please.) Four winners will be chosen randomly from the hop participant blogs. The comment period will close on Thursday, September 29th at 11:59pm. Winners will be announced thereafter. Good luck, and enjoy the rest of the hop! 🙂 Have a great week, friends! Your shaker is AMAZING and your scenery card is WOW…love your coloring! these cards are stunning I got to get these stamps sets. Wowsers!! Your cards are both absolutely stunning. I love the holiday border stamp, but was a little ho-hum about the stairway – you gorgeous creation has really shown me the possibilities of this stamp – WOW! I love your shaker card! So pretty! I love the shaker card! So pretty. The sequin set is devine! That background stamp is speaking my language, the shaker is fabulous. I totally agree with you – that figure and that dress, but I really want the dress the way you colored it. The color is luscious! Breathtaking! These are so gorgeous…thank you! Oh. My. Word. These are absolutely stunning! Love you watercoloring and your choice of colors on both cards. The scene in the second is AMAZING! Wow! Amazing cards. What a talent! Wonderful coloring! So much depth…love them both! I LOVE the look of the watercolor along w the embossing! SO gorgeous! Amazing!, Love them, want them, need them! Gorgeous cards! Love the poinsettias and pinecones along with the awesome sentiment on your first card! Beautiful coloring too! Second card has amazing coloring and a beautiful scene! So, so gorgeous! As always, you're phenomenal! Thank you for sharing! Words cannot describe this card. Great use of the two stamp sets! The scene you created is fantastic, beautiful work! I know that I am a broken record but videos please. Your coloring is so masterful, I want to learn from you. The background stamp is magnificent and I love it altered as a shaker. Always a pleasure to see your cards. Darling shaker card – so fun! And your second card – very charming. Thank you. I am speechless! These are both stunning. Just WOW. What a festive holiday border stamp! What a great release! The Cards are just gorgeous! That background scene is stunning!!! Both of your cards are incredible! I love you shaker card, I think the silver pearl EP looks amazing and I adore that sentiment. You other card is stunning, the detail in it is incredible. Thank you for the awesome inspiration! Both cards are awesome!! The shaker has the festive spirit!! Love the color on the dress!! Two amazing cards! Your shaker card is beautiful and your stairway card is stunning! Fabulous job on this new release!!! Hmmm, now that border stamp is awfully tempting. Your cards are so lovely. I love the pink poinsettia flowers. Oh my gosh I want that dress too! Lovely shaker and I like all the silver on the staircase card. The silver pearl embossing powder, on the Holiday Borders card is really pretty! Your cards are classy and elegant! Awesome cards, love, love, love the staircase card! Oh MY! Your cards are just gorgeous. Thanks for sharing them with us. The shaker card is awesome with those gorgeous colors & the Grand Staircase scene just took my breath away. Fabulous! Fabulous release and cards!!! The Born Classy is one of my favourite stamp set!!!! Love, love, love!!! Gorgeous cards! I love the way you did the shaker card! Beautiful shaker card, love that sequins mix and Born Classy card is so gorgeous and elegant, love the champagne flute and the silver border and all the details. Amazing coloring on both these beauties. Your 2nd card looks like a painting! Wow!! Both cards are just so beautiful & elegant! That staircase scene is just jaw dropping gorgeous!! Love the colors you used on the shaker card. And that staircase card is absolutely gorgeous. Amazing creations! Beautiful cards! Great colors! Love the poinsettas and pine cones used together! Great idea! The blue colour you chose for the Born Classy lady is so rich & elegant, and love the selective colouring for your Holiday Border shaker card . Simply stunning cards! Love the festive one! Love the beautiful cards created with these awesome stamps. Love your elegant scene. I'm with you on the figure on the female–it will just never happen in this lifetime!!! Both of your cards are beautiful! I love the shaker card, the poinsettia holiday border stamp, how you embossed it and colored the flowers, and the great sentiment! The woman dressed for a holiday party and her big home behind her are also beautiful! I like how you have her dress hanging over the frame a bit. This is a GREAT release from The Ton! What an awesome shaker card! WOW what an amazing job.. your creativity astounds me. Thanks for sharing. STUNNING cards – WOW – you GLAMOROUS scene takes my breath away – LOVE IT ALL!!! Both cards are stunning! But the Grand staircase is perfection with your gorgeous watercoloring, silver popped up frame, and her glamourous dress! I am stunned!! Your attention to detail like making the window with the snow, and Born Classy teal dress and a glass of champagne! You are so talented!! Gorgeous cards! Love the poinsettia shaker! Stunning cards! I love this release. Oh my gosh the teal dress is just gorgeous and love the shimmery twinkle in your shaker mix too! Great cards, thanks for sharing! 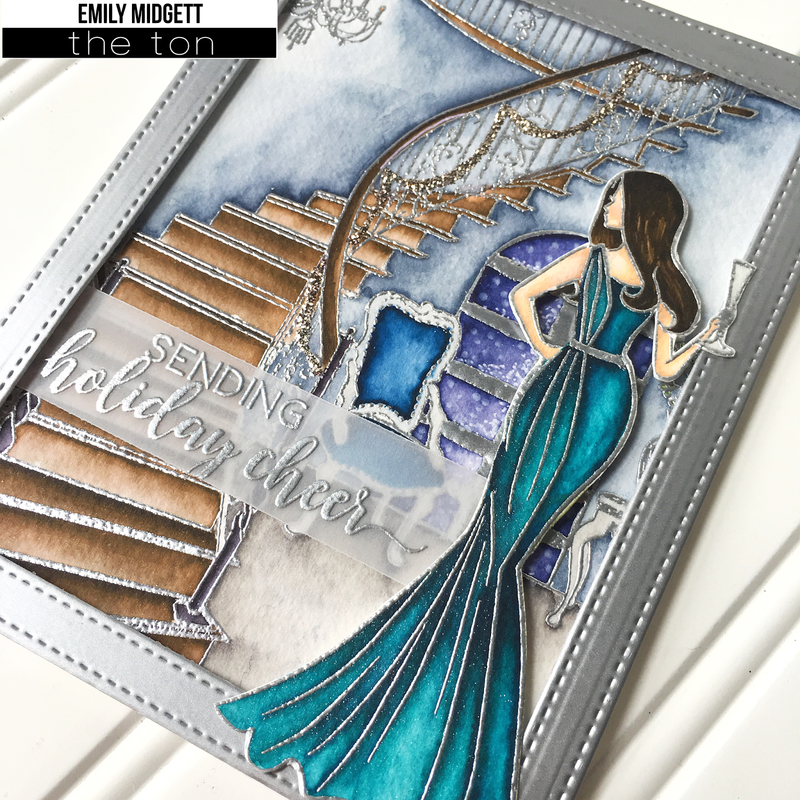 I love the silver and teal and coloring in your stairway card, it is fabulous!